Due to fear of clogged pores, I'll without fail cleanse my face (even if I only apply sunblock) with make-up remover first before using a cleanser. Have been using the Milk Cleanser from my dermatologist which cost arnd $40+ (170ml). It is a refreshing and gentle exfoliating cleanser for all skin types with natural botanical extracts, like Papaya and Mulberry. Ideal for make-up removal, it soothes and lightens the skin, leaving it soft and velvety smooth. My verdict: I really love the smell of the Milk cleanser, which is important for me cos it makes mi want to remove my make-up even more by using this product :p The texture is indeed smooth & soft. Use it over my whole face & use a tissue to wipe it off. However at times when I've heavy make-up on, I need to cleanse it twice before the cleanser. Cannot be use on waterproof mascara though. When I'm over at brulee's hse, i will use Biore Cleansing Oil (150ml @ anrd $15+). As quoted, it effectively dissolves and removes stubborn makeup, including waterproof mascara, while lifting away dirt and impurities. Unlike other cleansing oils, it leaves no greasy film on your face and maintains the skin's natural moisture balance. It does not emulsify upon contact with water, thus maintaining its optimal cleansing performance at all times. Just apply with dry or wet hands and rinse off with water for that clean and fresh feeling! My verdict: In fact I don't really like cleansing oil cos no matter what, it still feels oily to me. This product is only removable by rinsing off with water. DO NO attempt to use tissue/cotton pad, it is not as effectively. 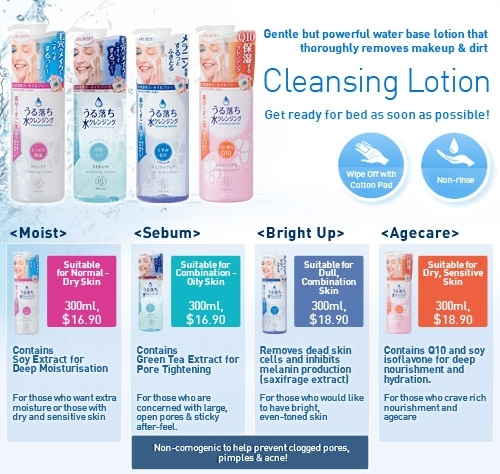 & I don't really like to use cleansing oil over my eyes (it make mi cant open my eyes properly after cleansing >.<), but it can easily remove my waterproof eye liner (seldom use mascara now) well enough.